Welcome to Ms. Jennifer Ward's online classroom for her Grandville High School students. Family support and guidance are integral to a student's success in the classroom. I hope the following pages will help parents and guardians support the work that students are doing in our English classroom. I welcome your comments, questions, and suggestions. Please review our syllabus for complete class details. 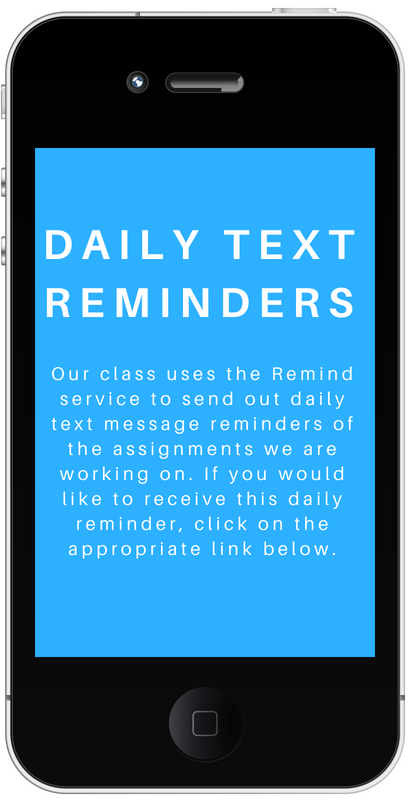 AGENDAS: Assignments will be listed on our daily agenda and shared on a weekly calendar posted at the beginning of each week to our class website. COPYING: Copying, cheating, and/or plagiarizing are grounds for failing the assignment and disciplinary action. Plagiarizing is defined as using someone’s research, ideas, words (whether they are the words of a scholar or another student) without acknowledging the author of the idea. If you had to look it up, you must give credit to the original author through parenthetical citations and a works cited page. WHERE TO FIND RESOURCES: All assignments, class notes, vocabulary, handouts, and literary definitions will be shared in our online space through Google Classroom. Expect to access our class website daily. 1st offense: the student will be informed that the assignment is missing, and will have five days to complete it; if it’s turned in within the grace period of five days, the assignment will receive the full earned grade. Any subsequent late or missing writing assignments will result in a grade no higher than a 60% once the assignment is completed to a competent level. ABSENCES: In the case of an absence, students are responsible for making up all missed work promptly. Students have one day to turn in missed assignments for an excused absence. Students will not be allowed to make-up work from an unexcused absence. Unexcused tardies and absences will have an adverse effect on a student’s grade. Please refer to the attendance and grade policy in the student handbook for specific details. Students should plan to speak to the teacher before or after school upon return and/or utilize information posted on the class website. GRADES: Students must meet all the standards, measured by successful completion of all required writing assessments, in order to earn credit for this class. Summative Assessments – Assignments that are designed to measure student achievement and skill level. Formative Assessments – Assignments that are designed to help students improve and practice important skills. Students will meet with their teacher to review areas of the unit in which they did not fully understand prior to a re-test/re-write. Students who have completed all pre-assessment work on time (daily work, homework, etc.) and do not have any unexcused absences during the unit are eligible for a re-test option to improve the intended learning outcomes. Students will meet with their teacher to review areas of the unit in which they did not fully understand prior to a re-test or a re-write. Re-testing or re-writing must be completed within the timeline established by the teacher. The highest score will be recorded. Students perceived as not taking the first assessment seriously so they can re-test will be referred to the administration and may be considered as violating our Academic Integrity policy. ​Parents will be notified by the classroom teacher. The following sites have been identified as being of value to the parents and family members of students. The National Education Association is an excellent resource for parents. The National Parent-Teacher Association fosters parent involvement in education. PSAT/NMSQ test information and study resources for students from the Khan Academy site. SAT practice tests from College Board. Parents Helping Parents is a site for parents of special needs children. College Savings is a site for helping parents plan for college expenses. And if you are looking to help build our classroom resources, here's my Donors Choose site for projects we are hoping to fund for our classroom.